City, University of London saw off Kingston University for a second year in a row to keep the Varsity cup. The two day sporting event saw City claim victory in men’s and women’s badminton, men’s and women’s basketball, men’s, women’s and mixed tennis, men’s and women’s volleyball and women’s football and men’s climbing. The deciding result came in women’s basketball game, where City ran out with an emphatic 80-40 victory at CitySport. The overall Varsity result read City 37 Kingston 31. Sofia Quaglia, (BA, Journalism) and co-captain of the women’s volley ball team who won 2-0, said: “It was great to win the last game of the season, and that everyone got to play. “We are specialists in coming back from difficult situations – even when things are going against us we know we have the team spirit to change it. “Teamwork is everything to us, as we literally see each other every day, we all study together, we all eat together – it is a bit weird! 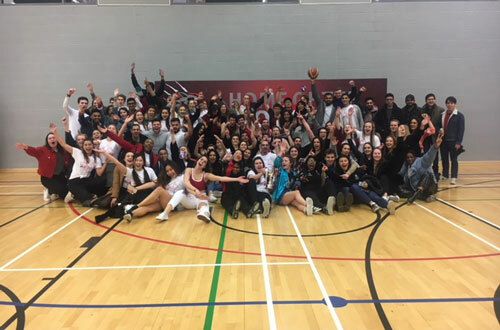 Aastha Mehta, (LLB Law) and co-captain of the women’s basketball team, said: “We had such a strong start to the game, so that really calmed our nerves and allowed us to have fun. “It was brilliant to have everyone playing, but also upsetting for me as a lot of my teammates are graduating this summer. Although keeping the cup has been a great send off for them!